Spring is here. This means sunny days are likely breaking up the rainy, windy days and you’re longing for the long nights of summer. Well, even though it’s not summer, we say it’s ok to pull out that dusty grill that’s been sitting covered for the winter months. What’s better than firing up the grill and throwing on some juicy meat, or better yet, juicy pineapple? 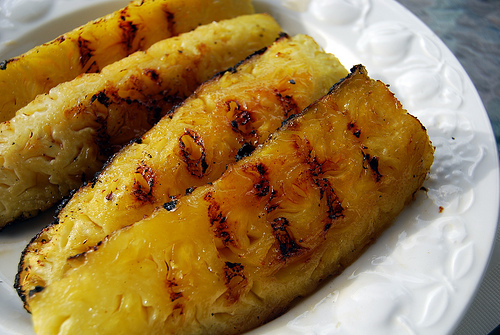 Pineapples are sweet and succulent right now and boy, there’s nothing like the flavor of grilled pineapple. So…what are you waiting for? Trim, core, and peel pineapple. Cut into quarters from top to bottom. Slice out the core from each quarter. Cut each quarter slice into four pieces (two pieces lengthwise and two crosswise). Y ou should now have 12 wedges of pineapple (about 3-inch by 1-inch each).